Welcome to one of the final interviews in The Twelve Makers of Christmas series. We have had smashing line up of crafts, gifts and products all being shared by lovely makers who have popped over to Crafting a Daydream for some Christmassy nattering. This continues with Samantha, a Crafternoon Tea Hostess! Lets get settled Samantha. Favourite Chritmas tipple? Has to be chocolate edition Baileys. And would you prefer Mince pie or Christmas pud? I host Crafternoon Teas, I'm a Textile Designer who loves vintage craft and supporting others to create bespoke crafted creations. My business is called 'Crafternoon Tea Hostess'! Based in Derbyshire our vintage craft parties are perfect for hen parties, bridal showers, birthdays and baby showers! 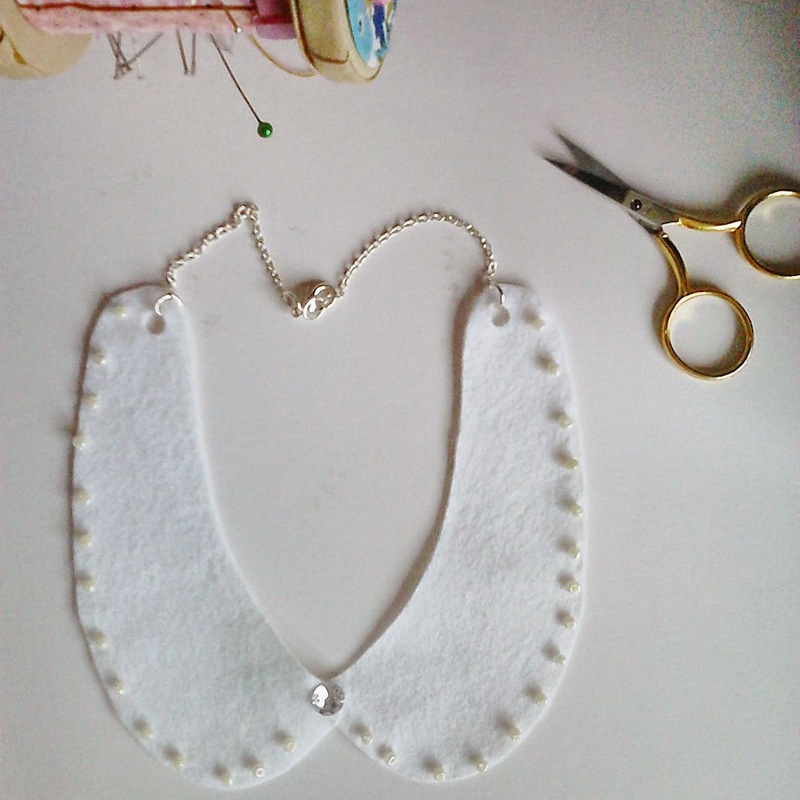 A textile bow necklace which we offered in our Summer 2014 party package. Since I was little, I'm in my thirties and have been working as a professional crafter for over 10 years. I've a degree in Textile Design and I wouldn't of gotten started if my Grandmothers and Mum didn't sew and knit. In my craft room or on the kitchen table at night so I can talk to my lovely husband whilst stitching. On the hashtag #teacakecraft on Facebook, Twitter, Pinterest, Instagram plus my website, www.crafternoonteahostess.co.uk. More Crafternoon tea projects to offer our lovely groups. With my new little family at home in Derbyshire with the extended family coming for Christmas breakfast and present opening. We are going to family for lunch but I like Christmas breakfast and with small children the morning is the best bit! I come from a cycling family so that's a big part of Boxing Day. The atmosphere, making, giving and sharing with the people you love. … my daughter, born in October. … no turkey, I'm vegetarian. … one my Mum made me as child, it's a Christmas pudding. ...every Christmas is lovely so I cannot name one. Thanks Samantha. It has been a pleasure having you over at Crafting a Daydream. I hope you have a wonderful Christmas. Thank-you for interviewing me! Great blog!